Hello all, friendly Internet Sean Brown here again, for a bit of a long-winded tournament report filled with Magic, strategy and feels. It’s been a long time since I’ve written anything and This Week in Legacy is on a slight hiatus (should be back next week, don’t sweat) because I’ve been incredibly busy. Because I’ve moved to Japan. I’d travelled to Japan last year, stayed in Osaka and Tokyo for a week each and realised that with the huge amount Japan has to offer, only by living there for an amount of time would I be able see everything. I’d been learning Japanese for the past eight months and living in the country should accelerate the learning process. I’d just graduated from my Masters in 2017 and have a job lined up for 2019. With this year available to me, now seemed like no better time to go find my independence in a foreign land and gain some life experience. There’re also some big Legacy events that coincide with my stay, right? Right. 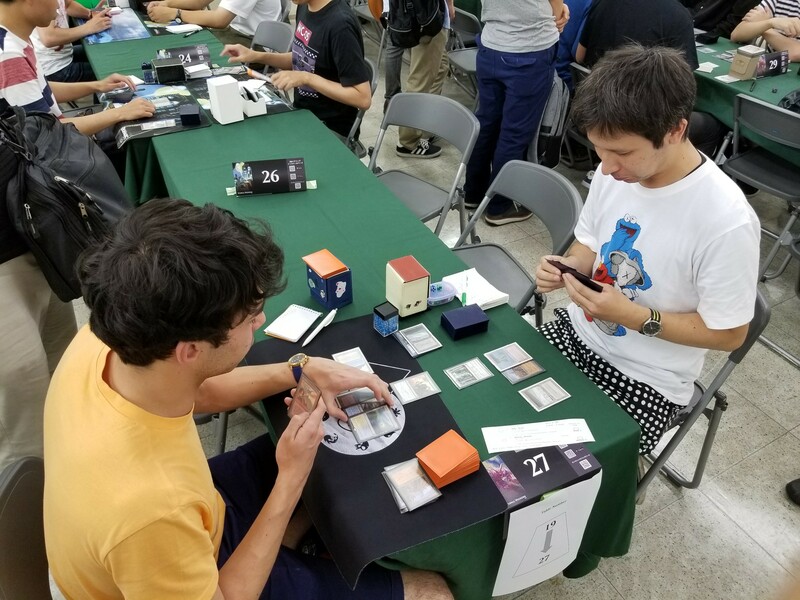 And one of them was Eternal Weekend Yokohama, over the weekend of August 18-19. My preparation for the event was honestly pretty scarce. With the Pro Tour gone by and Shadow, Grixis and Death & Taxes breaking out, I certainly did think about recalibrating my deck choice. Death’s Shadow in particular look incredibly appealing to me, and I gave it a spin at the final weekly I attended in Melbourne, Australia. Surprisingly, I beat Death & Taxes and Miracles pretty handily, despite these apparently being “difficult” Swords to Plowshares-based matchups. Turns out the pure efficiency, speed and hugeness of Shadow’s threats makes these problems less of an issue. I’d been tinkering with Grixis Shadow immediately after Deathrite’s banning, and although I think the pure Blue-Black main deck of Josh Utter-Leyton is basically perfect, I knew that I wanted the power of the Red sideboard cards like Abrade and Pyroblast – I wasn’t very keen to play clunky answers like Ratchet Bomb or god forbid Throne of Geth. However, I wasn’t confident in properly constructing a mana base (did I want Blood Crypt, Steam Vents? ), nor was I confident in playing the deck, and so I stuck to my guns. My guns being, of course, RUG Delver/Canadian Threshold. In the wake of Deathrite’s banning, it has been a wild ride with the deck, with people expecting it to reach the apex of the format, only to now be crowded out by the “superior” smattering of Grixis Delver lists and now Death’s Shadow. People have gone from showering Mongoose with praises to calling him laughable in the face of Zombie Fish once more. I didn’t care much for this sentiment, mainly because for me I knew that RUG Delver will always be miles above any of the other decks, because it’s just something I can play very, very effectively. Huge credit needs to be given to pilot familiarity – over the course of a long tournament, you want to be playing a deck where a lot of the lines are automated and you can conserve brain power. Hooting Mandrills. A small reason for this is that I sold my Goyfs, but also that Mandrills is incredibly good against the rising Grixis tide – I’d probably choose the Drills over Goyfs even if I had them post-PT. Grixis Control has huge headaches against Hooting Mandrills if you can Snare/Blast their Strix and keep Angler off the board. I’ve seen some crazy Snapcaster, try to block, Bolt Mandrills kind of plays, which usually end of netting us a two-for-one by running into countermagic. Trample is also as relevant as always. Life from the Loam + Barbarian Ring. The classic combo courtesy of Jonathan Alexander, to me this is a pivotal piece in dismantling Death & Taxes. Many have gone to Winter Orb to try and assist in this matchup, but I find that strategy too predicated on ensuring Vial doesn’t stick. With Loam, Vial can stick (although ideally you want it gone) and you can push through the mana denial and outgrind all their threats. It also comes in to dismantle Delver mirrors and clunky Grixis piles. However it’s very mediocre against Miracles and Blade decks (they’re way too basic heavy to make Loam-lock relevant) compared to Orb which is incredibly high-impact. I don’t think there’s space for Orb and Loam-Ring in the same list, so pick what matchups you expect or, in my case, the sideboard plan which you’re more comfortable with. Sylvan Library + Predict. Oh my, spicy. But this has reason. I mentioned issues with Miracles and Blade, but main deck Library is an excellent hedge against those style of decks, essentially being an Ancestral Recall + continuous filtration for the rest of the game. It also is incredibly powerful against Grixis Control too. Predict partners with this (but also any other cantrip) very nicely and is a great way to stay up on cards against the control decks, as well as fuel Threshold. It’s a liability in mana-tight matchups (Death & Taxes, Delver mirrors) but the aim of my main deck was to hedge against Blue-White decks game one (via card advantage spells) to make up for my unimpressive sideboard plan. It doesn’t look that notable, but my list is lacking sweepers of any sort. The two Abrades make this less of an issue (as does Barbarian Ring) by letting us bring in additional removal (even if it is relatively inefficient) for matchups like Elves etc. Abrades are also incredibly high-impact in matchups like Death & Taxes. I love this card; in long games against control decks this is an excellent mid-to-late game draw that partners up with your suite of hard counters (Blasts, Snare, FoW) to win all counter battles. It’s also very serviceable against any combo deck, although it can be somewhat clunky. More notable than my deck choice are all the folks I met before the event. The night before I met with fellow Salt Mine podcaster Matt Vaughan and a bunch of Magic players that connected with me via reddit or elsewhere. We jammed some FNM (well, I didn’t due to going to the wrong store…) and then were noisy gaijins drinking in a Yokohama food court. It was great to meet a bunch of such awesome people – and the event hadn’t even started! The next day I wandered into the event sight under the sweltering Japan sun. I finally met the eminent James Hsu before the rounds began and also sat across from none other than Mr. Kai Sawatari himself at the player meeting! Some photos were taken at some stage. Anyway, on to the tournament! What a start to the day. Round 1, I keep a very medium hand predicated on Stifle being good, along with some Wastelands. My opponent goes Plains, Aether Vial on the draw. I slump in my chair. This was not going to be my day. As I sadly draw Spell Pierce for my second turn draw step (“Why couldn’t you appear last turn? !”) I slightly regretted my deck choice. After a stream of idiots got Vialed in, I was dead. Game two was a little closer, but my opponent did not run out of fuel and soon had two Mother of Runes that I couldn’t answer, especially since his list was Cavern of Souls-heavy and negated my countermagic. As I drew Dismember and Lightning Bolts versus his Mothers I knew I was in a pinch. However, True-Name Nemesis soon gave me a route to victory, if I could stop him from setting up an offence. Unfortunately, a screw up led to me letting a Thalia resolve, which soon held a Sword, which soon killed me. The screw up was this: my opponent was top-decking and had one card left in hand turn after turn – it had to be Plow (or Path). Prior to Thalia resolving, I incorrectly Brainstormed back a Delver leaving me with Force (and no Blue card) and Dismember in hand. I think next turn I planned to play Delver and then flip it… Even though I knew he had removal. I should’ve left Delver in hand, Forced pitching Delver on Thalia and then maybe I would’ve had a fighting chance. Maybe I would’ve still lost with my removal offline anyway. Nonetheless, I didn’t correctly make use of the information I had. Nice guy from Barcelona. Game one I ended up running away with the game thanks to drawing a lot of removal, a Delver and a pile of Wastelands and soft counters. Him drawing two Karakas, forcing him to Stone Rain himself, also really helped. This matchup feels hella easier than Eldrazi, since our removal actually lines up, countermagic usually is online and the deck is soft to Spell Snare and Ancient Grudge. Game two, he resolves a Chalice on one and I don’t have Force – I felt okay because I had Daze, Pierce, Snare in hand and of course the possibility of drawing Abrade or Grudge. We don’t, and I die. Game three, I Daze a turn one Chalice and have removal galore (including a Grudge – which ended up being crazy good). I clean it up with some Wastelands, Monkies and True-Name. My opponent bemoans the fact that he drew his second Karakas again – he only plays two! I understand his feels. Game one I have a very nice hand, featuring cantrips, some Wastelands and etc. My opponent is on the draw and keeps. He cycles a Street Wraith… And then passes. One of those games, huh. He soon draws mana way too late against the ultra-mana denial deck and a Delver and Goose take it away. I actually hadn’t had much experience against the Shadow matchup with RUG, but I knew that I wouldn’t be going full shroud here. Having Delvers to aggressively punch their life total then burn them out had to be the plan when their threats are so much larger than ours. Our mana denial is also significant against them. Snare does nothing, and board out clunky cards. Being as lean and efficient in the “mana denial, burn them out” plan is what we want here. Ring is very nice as extra reach too! Game two I think I answer some Delvers, Dismember an Angler and cripple my opponent’s mana. I eventually get a Mandrills online with my opponent’s life total low and he has a Street Wraith Reanimated. He then goes to resolve a Shadow; whether it is with untapped mana or not, I cannot recall. I have a Force in hand, Blue card and a Brainstorm. I Brainstorm in response, finding an additional Force and a bunch more Blue cards. Probably the best Brainstorm of the day, I Force the Shadow, he Forces back, and then I win the counter war with my second Force. Mandrills soon cleans up. This guy rocks up with a Metalworker playmat and begins with some artifact shenanigans. I know what’s up here. Game one those artifacty shenanigans get me, though I did punt – I didn’t correctly assess how much mana he could make from Cloudpost, so I went to Wasteland his Inventors’ Fair, thinking he couldn’t activate it. He could, got a Wurmcoil and killed me with it. If I Wastelanded his Post instead, perhaps he wouldn’t have gotten to cast the Wurmcoil in the first place. Mistakes were made. Game two I remember riding a Delver, Mandrills and True-Name to victory. My opponent had piles of Ratchet Bombs, but the diverse mana costs of my threats were able to get him. Casting Mandrills into an on-board Ratchet Bomb besides Delver was sweet, since it meant I could keep the threats flowing without fear of them being swept away. Some Wastelands and attacks later and we were on to game three. Game three I get punked out by poor deck building. My opponent leads on turn one Sorcerous Spyglass… Naming my lonely Flooded Strand in hand. So, we’re needing to draw a Polluted Delta to get my hand online. I brick on my first draw and my opponent deploys a Metalworker. I have a Bolt ready to go for it so if I draw a Delta, I’m still in this game! I see a land off the top as I peel for my draw step and… It’s another Strand. Metalworker goes nuts and I die. Any excuse to play some Wooded Foothills. Game one is the usual clean-up Death & Taxes does to RUG, especially since I was on the draw. It was a close one though, with him down to low life against my Delver and only stabilising thanks to some Flickerwisp chaining. A Stifle at one stage would’ve been able to clean it up. In the second game I don’t really recall much of what happened. I think it was one of those Zoo games involving a Delver, a True-Name and a pile of Bolts to kill threats and eventually my opponent. Game three my opponent mulliganned to five and kept a hand really predicated on Wasteland being good. Unfortunately for him, my hand contained life from the Loam, nullifying his entire mana denial plan. I eventually found a Barbarian Ring and everything on board became completely irrelevant – even his active Mom. Brainstorm furthermore became an Ancestral Recall in conjunction with Loam to really pull me ahead. I think he eventually conceded once I found a threat. Game one I don’t have much going on in the early turns and my opponent Natural Orders a Ruric Thar. At some stage I try to Dismember it when I’m a ten life. I confirm in Japanese that Ruric Thar’s trigger is six damage. I concede. Key with this matchup is to stick an evasive threat, cruise it victory while countering relevant spells (Glimpse and NO) and killing relevant creatures. As such, it’s really important to get a threat on board ASAP otherwise they will just outgrind you. Both post-board games I get very lucky. I have double Delver in both of them (though in game two I am stuck on one mana for a while, but that’s okay for #RUGlyf), just enough countermagic to stop his Glimpses (Pierce is amazing vs. Glimpse, by the way, usually ending up as a pseudo-hard counter even if they pay) and enough removal to keep his board under control. I remember Submerging a Nettle Sentinel when I was on the draw and playing a Delver and felt very happy with myself. Free spells are neat. I’m not sure how I ended up in the Grixis Control bracket, but so begins my three back-to-back matchups against a deck my build of RUG Delver was very well prepared for. Game one I end up on the draw and once he identifies I’m on RUG he is able to capitalise on this with some smart fetching and focusing on resolving Baleful Strix. I have to climb uphill to kill them and use fragile threats like Delver to try and get there. Eventually Snapcaster-Kommand grinds me out. Going full shroud makes this matchup really cruisy, invalidating so much of their deck. Just make sure Strix and Angler don’t stick and your shroud threats can take the game away. Our card advantage engines are also really difficult to interact with (Library can’t be destroyed, Loam can’t really be interacted with). Note that I trimmed a Bolt here because the only threat you care about killing is Angler. Game two I resolve a turn two Sylvan Library and that basically locks up the game. I leverage my card advantage to ruin his mana, counter all his stuff and eventually ride some untouchable threat to victory. Trim some Stifles on the draw – drawing multiples is actually pretty mediocre post-board since your opponent can fetch around them. Game three is a slog fest with me getting off to a fast start, countering most of my opponent’s relevant spells and riding a Mandrills almost all the way to victory, but soon an Angler joins the party and the board stalls. I have a Mongoose join the board and Angler can’t attack lest I double block. But then a second Angler joins… But with my opponent on six life he still can’t make a move as if I have a Bolt, he’s dead. Eventually though I find a True-Name. However, after some Forcing and fetching my life pad says my opponent is on three life. I have a Bolt in hand, so I lead with that. My opponent says okay, and explains he goes to one. Eh?! We sort out the life discrepancy with the judge, but I still have to cast the Bolt, even though I wouldn’t of if the opponent was above three life. I then cast my True-Name with unfortauntely one mana down because of the Bolt cast, important if I need to fight a counterwar for it… It resolves, and my opponent shows me the Marsh Casualties in hand… And the fetchland he has in play if he wants to find his second Black source. He fetches and goes to zero. Game one I am on the draw, mulligan to five and get my hand shredded apart by Thoughtseize and Hymn. I try to protect a Delver all the way to victory, but that is not a winning proposition in these kind of matchups when they are so flush with removal. Bizarrely, my opponent had Spellseeker in the deck which I let resolve, which then found the Push to kill my Delver. I think I should’ve Brainstormed in response to counter it with a Stifle (as that’s exactly what I peeled next turn). Around turn five my opponent taps four mana and I’m ready to Spell Pierce a Jace (what a great feeling!). However, Kess, Dissident Mage will have none of that, and I’m soon very, very dead. I can’t remember the other two games too well. Since my opponent was playing with these notably clunkier cards, me massacring his mana base made quick work of everything (game two I remember him being stuck at one land) and I remember a Mandrills taking home the games. That tends to be the case game two – post-board we’re incredibly geared against them and can ignore so many of their cards. Again?! This time I take game one with the usual RUG Delver sweat, trying my best to defend a Delver which cuts his life total down. Eventually it dies, but a Mongoose keeps the pressure up. Eventually he’s stabilised at two life. I draw Ponder, shuffle and draw Bolt and kill him. Red cards are pretty nice. Game two we play a bunch of draw go for awhile, my opponent trying to weave around Stifle. We eventually develop our mana, but a Counterspell on an Angler lets me break serve and resolve a Library the turn after, which finds a Predict, which then snowballs into a very easy win with some Mongoose. This is some of the best games of the day. In game one I try my best to push a Delver through. I only see Tundras, Stoneforge and a Plow, so I’m expecting Blue-White Stoneblade, but eventually he cracks a fetch, Bolts my Delver and plays his own Delver. So we’re back to 2012, Jeskai against RUG. With my Delver dead and True-Name with a Batterskull attached to it on the table, I soon admit defeat. My opponent was at around three or four life when the first Batterskull connection occurred. It beats up other Delver decks by having eight removal spells in the deck (or even more) post-board. It has a terribly fragile mana base that is trying to resolve clunky spells. Delver and Stoneforge are very killable (Stoneforge is even less of an issue with Grudge and Abrade), True-Name Nemesis is the only threat of real concern. I have now opted to call this board plan “extreme full shroud” and will probably adopt it moving forward for Blade matchups (to likely mixed results, I’m sure). These decks hinge on overwhelming you with removal typically, so neuter that. I think this plan is particularly effective against Jeskai Delver, that doesn’t have any spells like Supreme Verdict etc. that are a big issue. Game two we play draw-go for quite some time, with my opponent not really doing anything… Eventually I get Loam + Wasteland online and I’m ferociously attacking his mana. Note that you really have to be careful when Loam-locking your opponent. Once you are on Loam-lock mode you are committing your mana to a sorcery speed spell every turn, and so it makes countering things very difficult. If a True-Name Nemesis slips through the cracks, all your mana denial is for naught. It’s often best to start casting Loam when you have one mana available, especially if you have Stifle in hand. This is exactly what I did, with me Wasting my opponent continually off Red mana (his third mana source) while holding up Stifle, meaning that even if he topdecked a fetch, he would still be unable to resolve anything. Once he missed a land drop, he conceded, realising he wasn’t going to be playing Magic any time soon. Game three was perhaps the coolest one of the day. My opponent got off to a fast start, with him playing a Delver (me killing it with a Dismember), a Stoneforge (Snared it) and another Delver (I think this died to a Bolt). Of course, I had to really carefully manoeuvre around the usual Wasteland, Daze and etc. while doing so. Eventually my opponent resolved a pretty scary card – Rest in Peace – and I had no answer for it. Loam and Mongoose were no longer viable threats (maybe), and the Barbarian Ring I had in play no longer functioned. I eventually Ponder into a Predict to pull me ahead, and deal with both his True-Name Nemesis (one with a Counterspell, one with a Force of Will) and although I cannot find a True-Name, I do find a perpetually 1/1 Nimble Mongoose that chips away turn after turn at my opponent’s life total. For around fifteen turns this goes on, with an opposing Delver appearing and then getting Dismembered at some stage (notably, I cast Dismember to preserve my Bolts for reach, with Batterskull not a worry thanks to an Abrade in hand), until my Mongoose is joined by another. Eventually my opponent finds enough mana to cast Batterskull through Daze, but I’m not concerned. I untap next turn and cast Abrade on it. My opponent Plows his own Skull out of desperation and this I Daze. I attack my opponent to three with two Mongoose. Then I Bolt him. Victory for 1/1 shroud idiots everywhere! Rest in Peace, no problems! My opponent shows me that his final hand was two Plows and a Bolt that were utterly useless. Extreme full shroud for the win. I ended up 33rd. Boo. Nonetheless, I have some final thoughts on RUG Delver. There is a lot of talk about the deck being antiquated, especially compared to the new Death’s Shadow and the Grixis Delver lists. I also was almost tempted by Shadow and its raw efficiency and huge threats for this tournament. But throughout the tournament I realised that RUG Delver was really my deck. There is no other deck that I could pilot and feel 100% confident in doing some crazy sideboarding like I did in the final round. There is no other deck that I feel confident that, every step of the match, I know what my plan is and how I am going to win. There is no other deck that has such a unique suite of threats that can cohesively enact a very specific game plan – Nimble Mongoose in particular was excellent throughout the day, even though the little guy has moments of looking mediocre. Every time I pick up RUG Delver for a large tournament, even though, like all decks, it has its ups and downs, overall it serves me well, because of the experiences I have gained alongside the deck and repetitions I have put in. At the end of the day, I don’t think the conversation is Grixis, Shadow or RUG. As cliched as it is, play what you feel most comfortable with, and that will serve you best. Because that has certainly been the case for me. If that deck is RUG Delver, or you would like to take the long, sometimes heartbreaking and painful training in the way of the Mongoose, then welcome to the family. Lastly, I’d also like to give huge shout-outs again to all the people I met at Eternal Weekend Yokohama. You are an amazing bunch, and I look forward to jamming games with you in Japan or wherever else in Asia we meet. I also must thank the Melbourne Legacy crew for their support as always and for being excellent competition that has skilled me up incredibly over the past two years. Lastly, thank you, the reader, for reading this report, and for those who have shown their support for This Week in Legacy. Thank you for being so patient with me recently, TWiL will be back in action very soon as I settle into my new home for the next six months! ‘Til next time, keep getting in with those 1/1 shroud idiots and keep on Stiflin’ those fetchlands. Next: Next post: Steven and Superfriends – The Gobcast, Episode 1.